Originally offering an evenings-only menu, Gastown’s French inspired L’Abattoir restaurant will now be opening its doors earlier to include lunch during the week. From Monday to Friday between 11:30 and 2:30 a simple and elegant menu has been crafted to please afternoon appetites. The classic and clean flavours that characterize L’Abattoir’s nightly fare have been carried onto their lunchtime menu. Highlights include Steelhead served with fried potatoes, dill and horseradish; a shrimp, tomato and potato frittata finished in creamy hollandaise and peppery arugula; and a beef dip with tongue, salad, thickly cut fries and jus gras for dipping. Diners can choose between a two or three course menu or select a meal a la carte. Behind the bar, resident expert Shaun Layton has designed some new cocktail creations to compliment lunchtime dining. This includes the House Aperol Spritz, which bottles charged white wine with Aperol, seltzer and orange, as well as their daily feature vermouth on the rocks served with a seasonal garnish. In homage to the power lunches of the past, a martini also graces the midday menu, made with Tranqueray 10, Dolin Dry and pickled onions. Non-alcoholic options include daily bottled house made iced teas and bottled cold brewed JJ Bean coffee. 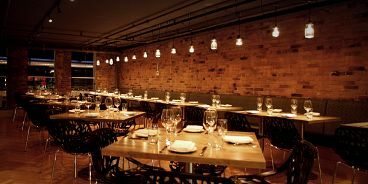 Lunch aside; L’Abattoir is also pleased to announce the debut of their private dining room. This 1,200 sq ft. facility is situated just adjacent to the regular dining room and features historical architectural elements complimented by a contemporary design aesthetic. Exposed brick walls, beamed ceilings and steel framed windows speak to the history of the space while sleek glass, steel accents and custom chandeliers add a modern finish. Entering through the kitchen the vintage Bonnet range oven takes center stage and denotes the quality dining experience awaiting guests. While large enough for 50 people seated or 80 standing, the room retains an intimate ambiance and a noise-reducing barrier blocks out the nightly hustle and bustle of the regular dining room. Basked in ample natural light, the private dining room at L’Abattoir is an elegant space with old world charm easily suited for any occasion, from private gatherings and celebrations to corporate functions and meetings. L’Abattoir is located in the heart of historic Gastown. Built in the 19th century it is the site of Vancouver’s first jail and originally buttressed the city’s main meat packing district. This history is reflected in the architecture, and the name L’Abattoir pays homage to the neighbourhood’s colourful past. Open seven days a week for dinner and now five days a week for lunch, L’Abattoir specializes in French inspired West Coast fare in a refined and comfortable setting. L’Abattoir has extended its dining hours on Friday and Saturday evenings, with the last seating booking available at 10:30pm. For reservations call 604.568.1701 or e-mail info@labattoir.ca. For private dining inquiries e-mail events@labattoir.ca.